This comprehensive exhibition features works by 760 artists from across Canada, including Inuit and Indigenous artists from Turtle Island. The exhibition brochure is available online here. Francesca Valente, Lead Curator of the exhibition, has selected artists from Central and Eastern Canada working in several disciplines: painting, sculpture, architecture, design, cinema, music and literature. Among the featured artists are: Rebecca Belmore, Edward Burtynsky, Douglas Cardinal, Jack Diamond, Robert Houle, Moshe Safdie, Andrew Jones, Mary Pratt, Michael Snow, Margaret Atwood. Jennifer Karch Verzè curated contemporary Western Canadian, Inuit, and Indigenous artists from Canada and the United States. It is a simple and powerful idea: to concentrate an enormous scope of vision – the work of almost 800 artists of various disciplines from across the vast territory of North America, including Canada’s far north – into a space one can hold in the palm of a hand. Painters, sculptors, photographers, architects and writers, each with their own vision and intent, working in mediums as varied and intimate as rose petals and sealskin, each creating a work on a canvas of 10 x 12 cm: that is the exhibition Imago Mundi Great and North, illuminating how such a diversity of landscape and practitioner can create an intriguing and inventive whole. It is affecting to witness the scope of the exhibit – the sheer number of works – and the intimacy of each canvas. Here almost 800 people have left their mark, a statement in their own hand, the size of a hand. It is a reminder of how various and vulnerable we are, a reminder in this agitated world of what it means to concentrate one’s full attention on the smallest detail. Great and North is part of an ongoing project that has been collecting these small works – all identical in size – from across the globe. It is a remarkable venture, and it is the grandeur of its ambition coupled with the humbleness of the size of each work that so slyly demonstrates the dual truth of human scale – both our reach and our mortality. Art imagines beyond the self, to something undeniably universal. It also says, poignantly, like these small canvases, “here I am”. 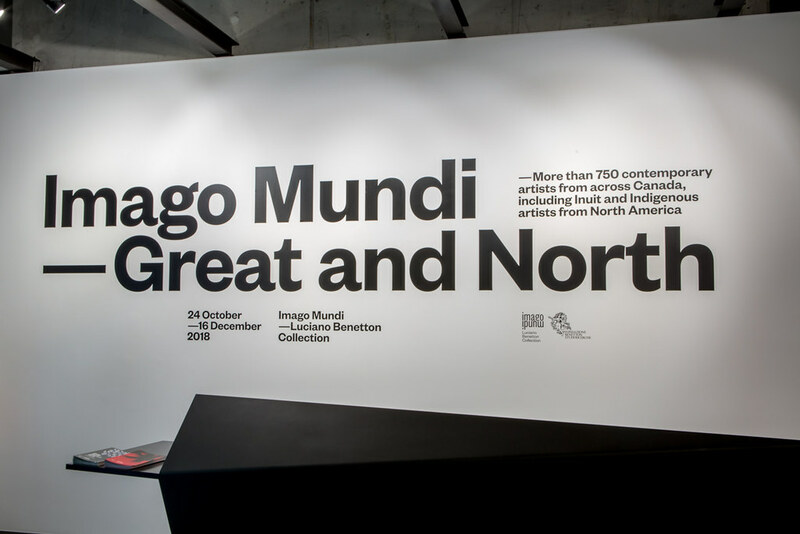 Imago Mundi is about Art and the World without borders — a democratic, collective and global map-in-the-making of human culutres at the start of the third millenium — as envisioned by Luciano Benetton, art patron and creator of United Colors of Benetton. With a single format, 10 x 12 cm, the entire international Imago Mundi collection brings together artists from every continent: to date, more than 25,000 from over 150 countries. Image: Meryl McMaster, Wayfinding, 2015, mixed media, 10 x 12 cm. Courtesy of the Luciano Benetton Collection. Free event as part of Onsite Gallery's public event program for T.M. Glass: The Audible Language of Flowers. Join us for a presentation on flowers throughout history, highlighting the specific uses of certain flowers then and now for their medicinal and therapeutic purposes. This will be followed by hands-on workshop where participants create their own oil infusion. Everyone will leave with their artistic jar of flower-infused body oil to take home. All materials provided. Kat Mahon is a Certified Aromatherapist with three years of experience working with natural plant medicines in a professional setting. During this time she cultivated a love for plants and their many benefits for the human body, creating useful and transformative products for clients. Her business Goddess of Beauty Cosmetics, reflecting her teaching and values, creates healthy, 100% plant derived and sustainable products that work wonders for the skin, hair, and mind. With inspiring energy, she loves to share her knowledge about the plants of our time and how beautiful and wonderful they truly are. Kotama Bouabane’s photo-based art practice is approached in an experimental ethnographic context. He is interested in how specific cultures are constructed by investigating people, places and things through photography and images. Boubane likes to explore how images are presented and circulated and how this influences our perception of identity and location. The research that he conducts begins with personal experiences but also references the history and theory of photographic conventions both traditionally and contemporary. Truth and fiction are inherent within the nature of the photographic medium and his work aims to blur the line between the two. Bouabane has an MFA in Studio Arts, Photography from Concordia University, Montreal and a AOCAD from OCAD. His work has been exhibited in many galleries including Centre A (Vancouver), The New Gallery (Calgary) and Gallery 44 Centre For Contemporary Photography (Toronto). He has received many awards and grants from the Toronto Arts Council, Ontario Arts Council & the Canada Council for the Arts. He lives and works in Toronto. April Hickox is a lens-based artist, teacher and independent curator who lives on the Toronto Islands. Over the course of over 35 years, April has mined the distinctions between personal and public sites through film, video, photography and installation. Her work with objects and still lives are rooted in narrative histories that individuals accumulate throughout their lives and the ability of inanimate objects to shape memory. Currently this direction in her work continues in both photographic and video works with Provenance Unknown, and Variations a series of video works exploring the studio still life. Hickox is currently associate professor of photography at the Ontario College of Art and Design University in Toronto. An active community leader, the founding director of Gallery 44 Center for Contemporary Photography, and a founding member of Tenth Muse Studio, and Artscape Toronto. For the past five years she has been a member of the curatorial board of Art with Heart Casey House. Notable exhibitions include the, Harbourfrount Centre, Winnipeg Art Gallery, The Maclaren Art Centre, The Oakville Galleries, Tom Thompson Memorial Art Gallery and the Canadian Museum of Contemporary Photography. Most recently her video work was shown at the Surrey Gallery in B.C. Meera Margaret Singh is a visual artist based in Toronto, Canada. She holds a BA in Anthropology, a BFA in Photography from the University of Manitoba in Winnipeg in Canada and an MFA from Concordia University, Montreal in Canada. Singh has been the recipient of numerous residencies and awards, most notably several Canada Council for the Arts production/creation grants, an Ontario Arts Council mid-career grant, and a Toronto Arts Council visual arts grant. She has been a selected artist at the Banff Centre for the Arts; artist-in-residence at The Art Gallery of Ontario; artist-in-residence at 1Shanti Rd in Bangalore, India; artist-in-residence at JACA Residency, Brazil; selected artist in an international residency with German photographer Thomas Struth at the Atlantic Centre for the Arts, Florida; scholarship winner and participant in the Magnum Workshop with photographer Alessandra Sanguinetti; visiting artist/instructor at the National Institute of Design in Ahmedabad, India; McCain Artist-in-Residence at the OCAD University, Toronto. She has exhibited widely in group and solo exhibitions throughout Canada and internationally. She is currently an Assistant Professor at OCAD University. Image (left to right): Kotama Bouabane, April Hickox and Meera Margaret Singh. Image: A Man Named Pearl (still), 2006, documentary film, 01:18 minutes, colour. Karen Azoulay is an interdisciplinary artist who works within the intersection of performance and sculpture in order to explore earth-elements and the female form. Solo exhibitions include CUE Art Foundation in New York (curated by Glenn Ligon); Four Gallery in Dublin; Mercer Union in Toronto, Primetime in Brooklyn, Dose Projects in Brooklyn and Drew University in Madison, NJ. Her work has been featured and reviewed in publications including The New York Times, The New Yorker, C Magazine, ReadyMade and Vogue. Her installations and performances include commissions for institutions such as The Art Gallery of Ontario, Canadian Art Magazine, and The Power Plant in Toronto as well as Art in General in New York. Recent exhibitions include Simone DeSousa Gallery in Detroit and Erin Stump Projects in Toronto. Her publication 'Flowers and Their Meanings, a guide for deciphering' was launched at The Perennial, a group show that she curated within The Grecian Shelter in Brooklyn’s Prospect Park. Image: Karen Azoulay, Absence, Poverty, I Have Lost All, 2015, pigment print, 40" x 32". Courtesy of the artist. Image: T.M. Glass, Hydrangeas in a Dutch Tulipière, 2017, archival pigment ink on archival cotton rag paper fused to Dibond, 58" x 58". Courtesy of the artist. Mary Anne Barkhouse was born in Vancouver, B.C. but has strong ties to both coasts as her mother is from the Nimpkish band, Kwakiutl First Nation of Alert Bay, B.C. and her father is of German and British descent from Nova Scotia. As a result of her personal and family experience with land and water stewardship, Barkhouse's work examines ecological concerns and intersections of cultre through the use of animal imagery. Inspired by issues surrounding empire and survival, Barkhouse creates installations that evoke consideration of the self as a response to history and environment. She currently resides in the Haliburton Highlands of Ontario. Mary Anne Barkhouse's work is currently on view at Onsite Gallery, as part of the exhibition, How to Breathe Forever. How to Breathe Forever underlines the importance and interconnectedness of air, animals, coral, humans, insects, land, plants and water. The belief that everything in the universe has a place and deserves equal respect is the core of this exhibition and positions our relations with others — including the 'natural' world — as active and reciprocal. The artwork invites you to consider a personhood that attentively collaborates and exchanges with all living things. Join the Inuit Art Foundation, Onsite Gallery and Indigenous Visual Culture at OCAD University on Wednesday, March 27, 2019 for an Inuit Art Quarterly Profiles Edit-a-Thon from 1pm – 4pm. The Inuit Art Quarterly Profiles is the definitive online resource for artists, collectors, curators, gallerists and others to learn more about the diversity and talent of Inuit artists, working in all media. A free and publicly accessible platform produced by the Inuit Art Quarterly magazine, the IAQ Profiles features historical and contemporary artists from across Inuit Nunangat and southern Canada. Cataloguing artist exhibitions, publications, achievements and more, this unique resource is maintained by the Inuit Art Foundation but needs you to grow! Join the IAF, Onsite Gallery and Indigenous Visual Culture staff on March 27 and contribute to this important resource! All public contributors from arts and culture professionals, to students, to those interested in Inuit art are welcome to help us create new entries or add to existing artist profiles. IAF staff will be available to assist artists in building their own profiles and provide tutorials to contributors. Bring your own laptop please, or bring a friend and share resources! Wi-Fi is provided.